Then, when calculated, each Pokémon has got an Individual Value from 0 to 15 which creates variation in different Pokémon of the same Pokémon species. The higher the IV, the stronger the Pokémon. 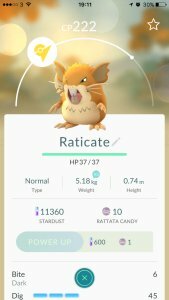 You have a 1 in 4,096 chance of having a Pokémon with perfect IVs in Pokémon GO. These stats are also what is used to calculate the Combat Points. This section will allow for the Pokémon to be listed based on their stats, sorted from strongest Pokémon to weakest.